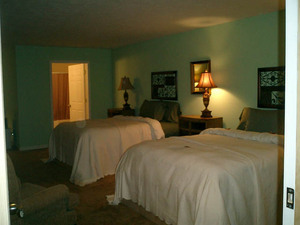 Max Occupancy: 4 Pistachio Queen Suite is located next to the covered back porch. Guest can step right out their door and out the door to the back porch. This elegant lush room features larger bath and door to accommodate wheel chair access. Each night stand and desk has a pull out to accommodate a chair and laptop.